At the end of Part One of this editorial series, "Learning from the top down", a fourth "power broker", George Soros, made his entrance to occupy the same lofty space as that held by Ted Turner and the two Bills, Clinton and Gates. Few Americans know much about George Soros. He is a financial giant whose economic opinions can tip entire markets from Wall Street to Hong Kong. Few of us are familiar with him because he is intensely private. He makes even Bill Gates look ostentatious. However, his involvement in major economic and political events elevates him to the level of Turner, Gates and Clinton. Soros' most recent and major contribution to world history has been his financial support for the Barack Obama presidential campaign. Prior to that, I would say his previous support of Russia's Vladimir Putin helped in the re-instatement of what might be called neo-Soviet policies. Soros is a self-avowed socialist billionaire. His endorsement of the present, increasingly dictatorial rule which Putin has instituted upon Russia is almost a sub-plot of Alex Goldfarb's book on the sadistic assassination of Russian dissident, Alexander Litvinenko. Litvinenko died by unknowingly ingesting an atomic bi-product, Polonium 210. Goldfarb's Death of a Dissident is now the plot of a possible movie which could shake many halls of power. As for the fates of the "Two Bills", Gates and Clinton are now more inextricably linked together than either would be willing to admit. Concessions to the communist orient by both Microsoft and the former Clinton administration are comparable to the prestidigitations of a magic act. "Now you see these concessions … now you don't!" Where is Ted Turner in all this? He is possibly helping Hillary Clinton become President of the United States. Without mentioning her name, Ted Turner simply said, "It's time for a woman to be President." He gave this rather general endorsement on the David Letterman Show last year. In that sense the Ted and Two Bills might be working together. They do not trust George Soros. 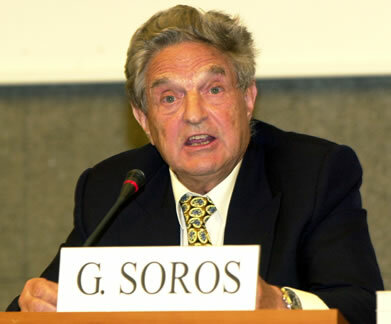 Soros is pro-Vladimir Putin, which would mean, as far as I am concerned, neo-Soviet. The "Two Bills" are pro-China. The Ted? He is still more pro-Russian than pro-Chinese, but I believe he supports Hillary Clinton. All three are American-style businessmen. However, the global market, obviously, is not particularly pro-American these days … so these three Americans have learned to adjust accordingly. What will be most amusing to watch will be the friction between Bill Clinton and his soon-to-be Presidential wife. She is not pro-Chinese … the feminist issue, you see. Beijing Bill will have quite a challenge twisting President Hillary's foreign policy postures to accommodate the generally, pro-Chinese heart of his "influence" … or, frankly, his personal interests. "I am doing my best" is not an acceptable answer to Beijing when the Chinese communist leaders ask, through secret channels, "What have you done for us lately, Bill?" On the other hand, Beijing is just good business for Bill Gates. If Microsoft has to obey communist censorship laws in China it will. So the entire situation really amounts to "Ted Turner and the Beijing Bills". Sounds a bit like coach and his basketball team, but that will not end up being the only metaphor. Ted Turner used to have the inside track with all of the old Soviets. How else could he get that worldwide, open-door policy for CNN and its reporters, assure them such free access to all Soviet controlled parts of the world? In that sense, Ted Turner was the first George Soros. It is one certainty of democracy that monopolies and monopolists can be watched carefully and, say, in the case of a greedy penchant for or display of wealth, such as that of publishing baron, Conrad Black, these financial supermen can be suddenly revealed as pathetically human and vulnerable to excess. Mr. Black's most garish excess has landed him in jail. So, with Soros backing Obama; Ted and the Two Bills all possibly supporting Hillary … the old version of American politics has been turned upside down. Millionaires like the Clintons, and billionaires such as Turner, Gates and Soros are Democrats, not Republicans. Also, the controversial legalization of abortion is not supported by America's old version of "individual selfishness", the Republicans, but endorsed by the "party of the people", the Democrats … the millionaire and billionaire Socialists … or Marxist capitalists. Hmmm … learning from the top down is to realize that the world, indeed, or at least the United States of America, has been turned entirely upside down. Michael Moriarty is a Golden Globe and Emmy Award-winning actor who starred in the landmark television series Law and Order from 1990 to 1994. His recent film and TV credits include The Yellow Wallpaper, 12 Hours to Live, Santa Baby and Deadly Skies. Moriarty is also running for President of the United States in 2008 as a candidate for the Realists Party. To find out more about Moriarty's presidential campaign, contact rainbowfamily2008@yahoo.com.